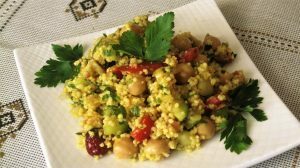 I have been searching for recipes with couscous and chickpeas, and came up with this combination which I am sharing today. It is such a fun vegetarian dish for healthful eating, and a great addition to my recipes for the Fat Smash Diet (check out this link), and for Lent (check out this link). Since I have read so many different recipes, and created my own version from all these combinations, I am not able to pinpoint any particular one for you. I will post my version, but you can play around with it as well, and change it to suit your taste, or make it my way. This salad may be prepared 1-2 days before serving. This recipe yields about 6 cups of salad. You may also add some avocado slices at serving time, or sprinkle it with shredded cheese, or even add some chopped up cold cuts to made a “stick to your ribs” lunch or dinner. Mix all Dressing Ingredients in a medium bowl, and whisk well to form a smooth dressing. Refrigerate it for now. In a medium pot,bring 1 cup of water to boil, add 1 cup of couscous, stir, turn off heat, cover and let it sit until all the water is absorbed (about 10 minutes). Fluff it up with a fork, and set it aside. Remove plastic sleeve from the English Cucumber, wash the cucumber, trim off both ends, cut it lengthwise into quarters, then slice crosswise to dice it. Place in a large bowl, and set aside. Dice all remaining veggies, add to cucumbers. Toss gently all veggies, to distribute them evenly. Fold in couscous, using a spoon. Pour in the dressing, and toss gently to coat veggies evenly. Serve as is, or with a side dish of diced avocado, sliced hard boiled eggs, or cut up cold cuts.